Toilet learning can be an anxious time for toddlers and parents, as there is nothing better than being free of diapers, whether cloth or landfill/disposable. As unique as my children are in personality, so were their toilet learning experiences. For my daughter, the [amazon_link id=”B000056J7L” target=”_blank” ]Baby Bjorn potty chair[/amazon_link] was her special place. For my son, he wanted nothing to do with a small plastic potty and went straight to the grown up potty. Munchkin’s Arm & Hammer™ 3-in-1 Potty, the most sophisticated toilet training product available today, is a fresh take on the classic potty. 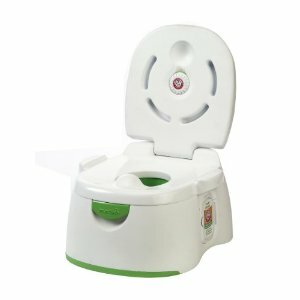 With a sit-down potty, removable seat to use on a standard toilet and step-stool, this 3-in-1 potty also features a disposable Arm & Hammer™ deodorizing disk and built-in flushable wipes. The patent-pending potty combines the odor-eliminating power of ARM & HAMMER® Baking Soda with clever innovations by Munchkin, to address parents’ concerns for sanitation and odor control. Would I buy this product? No. There isn’t anything eco-friendly about it other than the use of natural baking soda. It’s a lot of plastic! Sure, versatility and multi-functionality are good for the Earth; however, the time a child really needs a plastic potty, if at all, is very brief. Greener versions are available, such as this wooden potty chair or bamboo trainer seat. You might want to take a look at arguments which say that the natural way of doing our business is to adopt a squatting position.